One thing I like about living in Malaysia is the food. 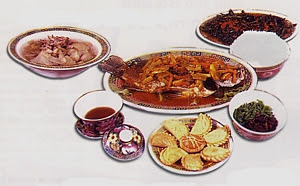 Basically, you are living in a food lovers paradise, with all the different kinds of cooking: Malay, Chinese, Indian, Nyonya (Straits Chinese- Chinese immigrants who intermarried with the Malays and have their own unique culture and style of cooking), Thai, Western, and all the various different styles of each kind. This Blog gives you insight into the style of coooking they have in Penang, which is about an hour away from us in Taiping.